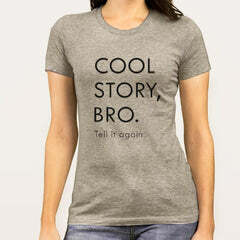 "Cool story bro. Tell it again." It's just a cool way or we should rather say, a polite way to say that you don't give a crap. If you have a lot of people around, who bore you with their completely uninteresting stories that go nowhere. Feel free to show disgust and indifference towards their boring rant with an attitude.